SendGrid was founded almost 7 years ago by 3 developers who were acutely aware of the challenge to manage and maintain an in-house email delivery infrastructure. As innovative developers, they set out to solve this problem and in doing so, they created SendGrid, the world’s first cloud-based email infrastructure platform. 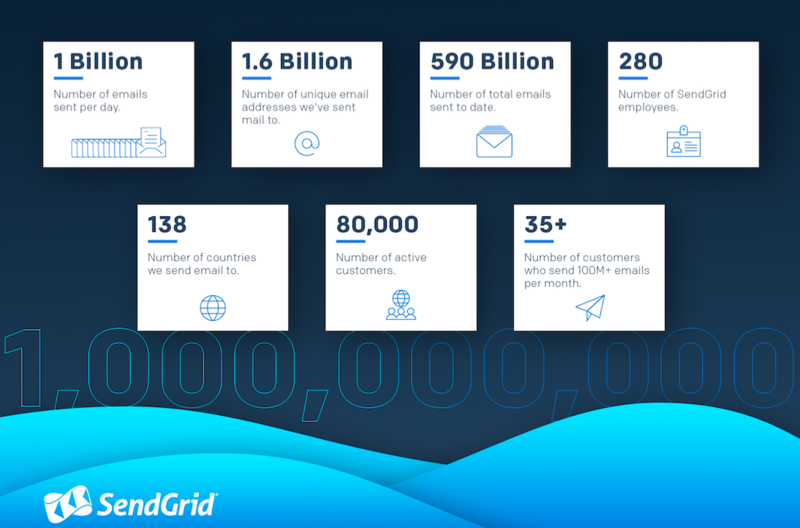 Since its inception, SendGrid has continued to serve developers’ needs and is now sending over 23 billion emails a month, via the cloud, for over 80,000 active customers. While developers remain our core focus, we recently introduced Marketing Campaigns, a SaaS-based marketing email feature set providing marketers and non-technical users the ability to send mail via a simple and flexible user interface (we also have an API for that!). While a slight departure from our infrastructure business, interestingly, it was the SendGrid developer community who told us they needed a marketing email tool in order to enable their marketing team to send one-to-many communications. Remaining true to our core developer audience will always be part of our goal of creating customer value. While transactional email vendors like SendGrid have been referred to as owners of a utilitarian “dumb pipe,” sending API-based transactional email at scale is actually a hard business. It’s difficult to create an email infrastructure that is not only reliable and scalable, but is also capable of mitigating attempts by bad actors seeking to exploit these “dumb pipes” for fraudulent and nefarious purposes. This is why at SendGrid, we deploy a rigorous customer provisioning process, numerous traffic management algorithms, email authentication requirements, and anti-phishing technologies to block attempts to send unwanted mail from our system. We also continue to invest in growing our compliance team, our account management and our 24×7 technical support teams in an effort to support and provide best practices to our customers as well as support our commitment to the email ecosystem. We’re also continuing to work on growing our brand, which is infused by the personality of our company. Our company culture has proven to be one of our strongest assets which impacts how we run our business on a daily basis. Early on in SendGrid’s lifecycle, our executive team understood the need to create a business that was built upon a core set of principles, a unique set of values that manifest how we run our business including our hiring practices, our business policies, and how we interact with our customers. We call this our “4H culture” (Honest, Hungry, Humble, and Happy). This 4H culture translates into ensuring we are honest when communicating with our customers, that we are hungry in driving new product and feature opportunities that create value for our customers, that we are humble with ourselves and within the email ecosystem, and that we as employees are happy inside and outside of work which tends to translate into happy customer experiences. No company is perfect. It’s difficult to scale and to grow a business that consistently creates value for its core customers. What sets good companies apart from the rest however is an ability to stay focused on your customers, being able to consistently delight and deliver value for those customers, and to operate from a set of shared core values that are fundamental to the company’s success. If you are in the market for an email service provider to send your transactional and marketing email, check out our pricing at www.sendgrid.com/pricing. You can also contact our sales team at sales@sendgrid.com. Jesse McCabe has over 13 years experience working with emerging internet, security, and email technologies. As the Director of Product Marketing at SendGrid, Jesse is responsible for defining, positioning, and driving market adoption of SendGrid’s industry leading email deliverability products. Prior to joining SendGrid, Jesse was Director of Product Marketing at Return Path where he led the go-to-market effort for Return Path’s suite of anti-phishing and email authentication solutions. Jesse has a BS in Business Administration from the University of Colorado at Boulder and an MBA from the University of Denver, Daniels College of Business.